Preheat oven to 400 degrees. Combine all ingredients except the cheese and potatoes, and bring to simmer over medium high heat. Whisk in half of cheese, mixing until smooth. Toss the potato slices in the sauce then transfer to a buttered 13x9x2 glass baking dish, spreading evenly. Cover with foil and bake 15 minutes. Uncover and bake until potatoes are very tender and liquid bubbles thickly, about 50 minutes. Dot potatoes with remaining cheese and bake just until cheese softens, about 5 more minutes. Remove from oven and let cool 10 minutes, or so, before serving. Toss the cauliflower florets in the oil, salt, and pepper, arrange in a single layer on a baking sheet and roast in a preheated 400F/200C oven until lightly golden brown, about 20-30 minutes. 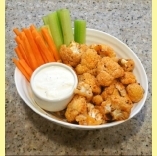 Toss cauliflower in the hot sauce and enjoy warm with blue cheese or ranch dressing for dipping and celery sticks on the side.